Epimediums are often championed for dry shady sites, but we would recommend that you are likely to get better results with a semi-shaded site with good quality soil that is well drained, but does not dry out. The origins of the “dry site” tradition can be found in the history of these plants coming to the attention of Northern European gardeners. Until the 1980s most of the Epimediums that were commonly available were collected from either Continental Europe or North America, where they can be found growing in drier conditions. Examples of these are Epimedium rubrum, E. perralchicum and E. versicolor. However, in more recent years collections have benefited from an increasing availability of species and cultivars of Chinese origin. 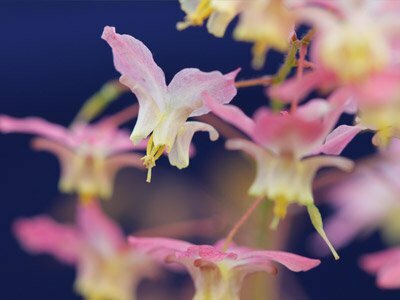 These, often showy Epimediums prefer more dappled shade and fertile friable moisture-retentive soil, which is well drained over the wet winter months. We recommended that these Epimediums should be planted in a sheltered location and kept watered during their first year and covered in a good mulch or organic matter such as leafmould through the winter. Epimediums spread via woody rhizomes located just below the soil. Their rooting habit can be split into two groups: the fast spreaders; and the clumpers, which are slow to spread. Division is generally best after flowering, for both groups. The tight clumping forms make good ground cover, but tend to be more difficult to divide. 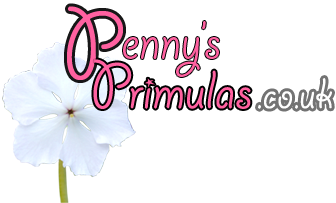 A sharp pair of pointed nosed secateurs or scissors may prove beneficial, although an old sharp kitchen knife might prevent damage to your valuable gardening equipment. The roots from all divisions should be cut back to about 10cm in length and at least two thirds of the foliage should be left on the divided plant to encourage it to produce new roots. Epimediums do best in fresh nutrient rich soil. The spreading forms such as E. perralderianum, E. sempervirens and E. x warleyense tend to make their own way into fresh soil and are easy to lift and divide. However, the clumping forms such as E. acuminatum, E. davidii, E. diphyllum, E. franchetti, E. grandiflorum and E. x youngianum, will benefit from being lifted, divided and replanted into fresh soil, every three to four years, to prevent congestion of the roots and to keep the plant healthy. Many of the established varieties and increasingly the new cultivars are considered garden-worthy because of their beautiful foliage, which is changeable through the seasons, as well as the often, stunning display of flowers. Some species are fully herbaceous and will die back for the winter. Many others are semi-evergreen, in that the leaves will remain on the plant through the winter, but will begin to look tatty by spring, when the new growth will come through. 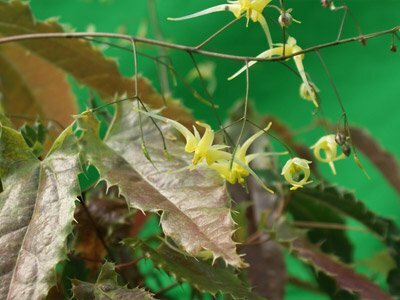 We recommend that you should leave the foliage until mid-February before tidying up and cutting back your Epimediums plants, allowing the new growth and early flowers to be seen at their best. The further north you are in the UK, the later into the spring you should wait before tidying up. Allow the old leaves to protect the plant crowns and newly emerging flower buds and leaves from the worst of the frosts. Dry shallow soils should be enriched with humus and leafmould and an addition of a slow acting fertilizer is recommended. The ideal location is somewhere that can provide a good leafy soil, not exposed to frost or harsh drying winds, which can damage the first leaves of the year and no summer drought. Epimediums will be found growing happily with hellebores, ferns, pulmonarias, tiarellas, bluebells and on our nursery, Primula sieboldii in the lighter shade. Epimediums tend to be self sterile and therefore do not come true from seed. Bumble bees are much better pollinators than ‘hive’ bees as they happily go between different species. Viable seed ripens in elongated pods which normally mature approximately 45 days after pollination. When the pods ripen they spring open, releasing seed all around. Sow the seed immediately, the fresher the better. Leave the pots/trays outside over the winter, do not cover. They need approximately 60 days at temperatures 4 c or below to germinate. This normally takes place in the spring. Flowering normally takes place in the second year with better displays as the plant matures.